Under the Gas Safety Regulations 1998 , it is the duty all employers and landlords to commission an Annual Gas Inspection. This must be conducted by a Gas Safe registered engineer. A written record of the inspection and other works has to be be maintained as it is regarded as a вЂliving documentвЂ™. Our gas safety inspectors are experienced professionals of the highest standard. We are accredited members of Gas Safe?? ?вЂ“ guaranteeing that our work complies with the law and is performed by experienced professionals. Our comprehensive Gas Safety Inspection service carries out your legally required annual safety check, issues a safety certificate and identifies any remedial work. We also provide round the clock servicing, maintenance and repair. By law you must conduct an annual safety inspection of all appliances in your premises. You must keep a record of these inspections on file for 2 years. Landlords must issue copies to existing tenants within 28 days of the check and new tenants issued with a copy before they move in. Gas Safety Check - Which aspects of the system require testing? All components which are part of your supply and all appliances. This includes all heating and cooking appliances, flues and ventilation. Gas Safety Check - Do I need to carry out a safety check on my LPG appliances? Yes your duties are the same as for natural gas and require a Gas Safe registered engineer to conduct safety checks and any maintenance or repair work. Gas Safety Check - Who should do the work? By law, all gas safety inspections and maintenance work MUST be carried out by a Gas Safe registered engineer. How often are Gas Safety Checks required? What happens if an item fails a Gas Safety Check? вЂњThe gas safety check record is a record of the results of the checks carried out for the annual gas safety check. It should be issued on completion of the checks and not delayed even if defects are found or until necessary remedial action has been taken. The record is a вЂliving documentвЂ™ and landlords should supplement it with records of any follow up action taken (if required). This would provide a full record of the gas safety within the property. We will provide a no obligation quotation to repair any defects to the standard required by BS what? and issue the required certification once the fault has been rectified (see above – is this true? )We do not charge for the replacement of small items – only for the parts themselves (True?). Gas Safety Check - What are my duties as a landlord? All commercial landlords who rent out property must have a valid Gas Safe gas safety certificate for their premises. This certificate is valid for 12 months or until the tenancy changes hands and can only be given by a Gas Safe registered gas engineer. All Landlords are required by law to hold a current LandlordвЂ™s Gas Safety Inspection (CP12) Certificate. Gas Safety Check- Is the inspection disruptive? In general it is not possible to conduct any testing without some disruption; the level of disruption will depend upon the type of system and its environment. Our staff are trained to keep such disruption to a minimum. If necessary we could carry out the testing outside work hours (after 5pm Mon-Fri or all day Saturday). Gas Safety Check - What evidence do we get that the inspection has been completed? 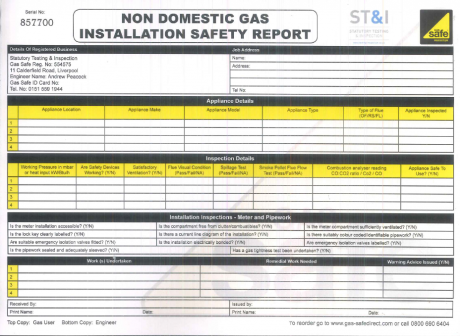 A Gas Safety Certificate – which identifies the work to be done? We are happy to discuss with you any of the technical aspects of the Safety Report. What's the difference between a Safety Check and a Service? There is a technical difference but it makes sense to consider conducting both at the same time and building into your annual monitoring of premises safety. A service includes a thorough clean of the appliance as well as the gas safety checks. Gas Safety Check- How much will it cost? There are many factors that can affect the cost of a Gas Check such as type of installation, location, access and availability. It is always good practice to establish a cost per test quote as this will cover both parties.